The close sibling “identification” photo of child star Kim Yoo Jung and Lim Si Wan becomes a topic of discussion. On January 10th, 2012, Kim Yoo Jung tweeted on her Twitter account, “So handsome! Please do not at my side,” and uploaded a photo. 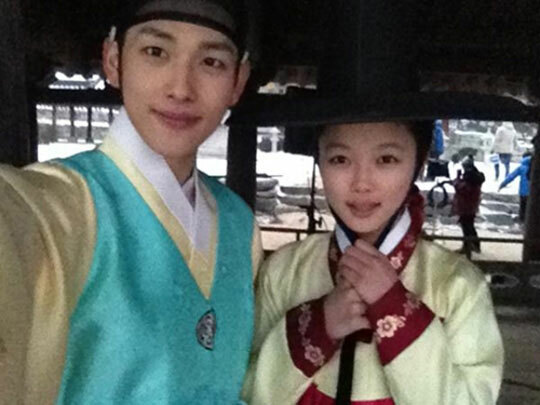 Kim Yoo Jung and Lim Siwan who are playing the roles of siblings in MBC’s The Moon that Embraces the Sun wore hanbok respectively, and posed an intimate style, attracting attention. After seeing the photo, netizens commented, “A pair of warm siblings,” “The face of Kim Yoo Jung is so beautiful, looking forward to the future development,” “Lim Siwan is shining treasure wherever he is,” and so on.